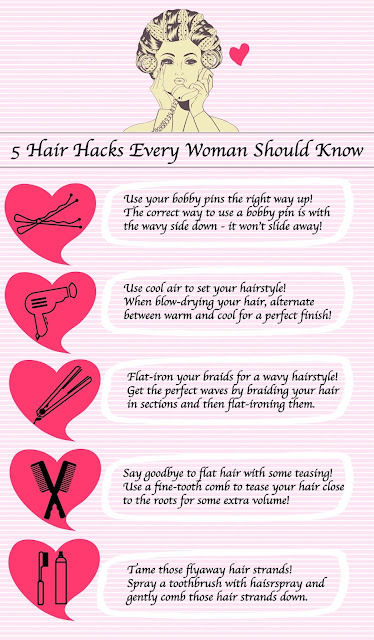 Guest Post | Hair Hacks Every Woman Should Know! Everyone’s looking for simple ways to make their hair look and feel better. With that in mind, try these handy hair hacks to learn everything from how to bring body to your hair and how to keep it looking shiny and smooth. Know your products, hair tools and accessories well and you will have a good hair day every day! Combine these simple hair hacks with other styling tips like how to straighten hair – which you can find here. Here’s everything you need to know to give your hair that everlasting stroke-worthy look. • Instant shine is just one brush away: Boar bristle brushes lift your scalp’s natural oils from your roots and redistribute them along the length of your strands. This helps your hair look cleaner, shinier and smoother. For thick hair, go for a bristle and nylon brush to detangle your mane too. • Curls – the fast way: Want curls, but don’t have much time? Try this easy hair hack: make a ponytail on top of your head. Divide your hair into two sections. Curl each one. Bend forward to pull out the hairband, so your hair is over your face. Being careful of your eyes, apply hairspray. Then flip your hair back for instant curls! • The one accessory you need for a full ponytail: Bring body to your ponytail with a butterfly clip hidden inside. Divide your ponytail in half, holding the upper part against your head. Place the clip in the middle of your ponytail, with the grips on either side. Backcomb the top half of your ponytail, apply hairspray and then smooth down. • The easy route to sleek hair: If you want to know how to straighten hair with a sleek finish, start by cold rinsing after washing to lock in precious moisture. Use a hairdryer with a narrow nozzle and a round brush to smooth your hair from roots to ends, section by section. And never skip the application of heat protection spray before styling!